New book, some shelf wear to jacket. 397 pages. This is the story of Irish Nationalism, from the legendary king Brian Boru, who united the chieftains of Iraland to drive out the Vikings, to the still-unresolved conflict in Northern Ireland. 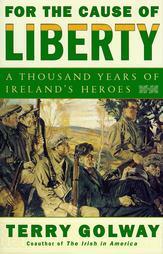 The author recounts a thousand years of Irish history, brilliantly describing the achievements of the patriots who kept alive the dream of Irish freedom until they finally succeeded.